This is your chance to win cool prizes from Vivo! If you are fan of NBA superstar Stephen Curry or you simply want a brand-new phone for the new year, then join the Vivo Grand Christmas Giveaway pronto. No purchase is necessary. Simply take a selfie with a Vivo V7 or V7+ with the watermark feature and upload it to the Vivo Grand Christmas Giveaway website here, along with your personal details. Don’t forget to write your Christmas wish for your fellow Filipinos. Share your entry on Facebook and get your friends to vote. The entry with the most number of likes will win the grand prize. Upload your selfie via the official promo website at https://vivoglobal.ph/christmasgiveaways. Fill in the other required details (refer to Steps 3 and 4) and upload your entry. Register in the website by filling in the participant’s Name, Birthdate, Contact, Number, Email Address, and Location (City) on the fields provided. On the “Christmas Message” field, write a short message containing your wish for your fellow Filipinos this Christmas Season. Participants must also share their selfie in their Facebook accounts with the share button provided in the website. Posts must be made public in their Facebook pages. For non-Vivo V7/V7+ users, entrant must go to any Vivo concept store or multi-brand stores and approach a store personnel to guide them. A demo unit will be provided to facilitate the taking of the selfie. Upload of the selfie and access of their Facebook account will also be done with the demo unit. Access to their Facebook accounts will be logged out in front of customer right after uploading to make sure there is no breach in privacy. For more chances of winning, a customer may submit an entry every week provided that the selfie image and Christmas Message are unique from his/her previous entries. Nine winners will picked daily through electronic raffle (via http://www.randomizer.org) and will receive exclusive Vivo merchandise. Three entries with the highest number of votes in the website will win special prizes. A voter can only cast his/her vote for a particular entry only once per entry through the website. Uploading and voting is open until 5:00 PM of every Friday, voting automatically closes beyond the given time. Any entry uploaded after 5:00 PM Friday, will be considered for the next week’s pool of entries. Winners will be announced at exactly 6:00 PM of every Saturday of the contest week. 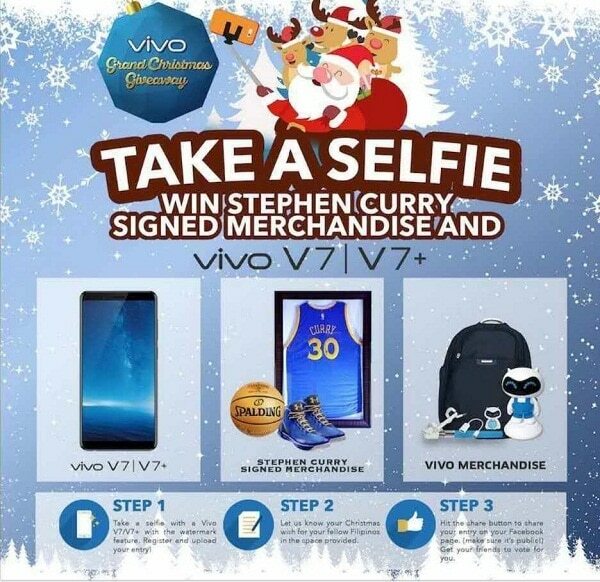 Every week (until January 6, 2018), a lucky contestant will win a signed Stephen Curry basketball merchandise (either a ball, a jersey, or a pair of shoes) and the second and third placers will win a Vivo V7 and a Vivo V7+ smartphone, respectively. Vivo bags, baskets, and fans will also be given away daily. Personally, I am not a big fan of Stephen Curry so I think I might settle for the second or third prize. My problem is how to borrow a Vivo V7 or V7+ phone since I don’t have one and I’m too shy to go to the Vivo store to make use of their gadget. But who knows, I might find the courage someday. Don’t forget to head over to the Vivo Grand Christmas Giveaway website here and submit your entry.